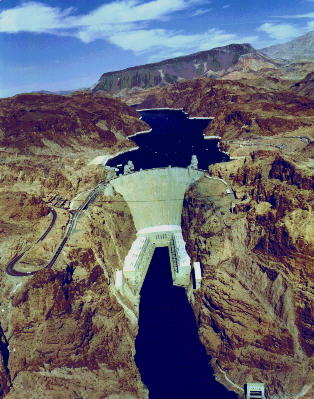 Gathered on these pages are photographs of Hoover Dam, both recent and historic. The photographs are presented on the page as thumbnails, or small pictures. This will allow the page to load quicker. Click on the photograph in which you are interested for a larger view. A new browser window will open to display the image. Close the window to go to a different photograph. Dam Views - modern views of the dam. Power Plant - views of the generators and other equipment. Historic Views - views from the period of construction. Old Post Cards - a collection of old post cards. Click on the links in the navigation area to the left to move from section to section. For information on ordering prints, video footage or other images, contact the Lower Colorado Regional Photo Lab staff by e-mail to:lcmedia@usbr.gov, or by phone at 702-293-8591. If a photo number is listed, please use that for any requests.